M16 (Messier 16) is known by amateur astronomers and astrophotographers as the Eagle Nebula. This well-observed area of the night sky is a large cloud of gas and dust where new stars are born. When you take a look at the wispy glow of this nebula through an astronomical telescope, you are witnessing a stellar object that is approximately 7000 light years away. The newborn stars in the Eagle Nebula are very hot, which illuminate M16’s hydrogen gas as seen in the Pillars of Creation, made famous by the Hubble Space Telescope. These intense pillars are slowly evaporating under the intense glare of the nearby massive, newborn stars. These pillars may appear relatively small within the nebula itself, but in actuality they are larger than our entire solar system. 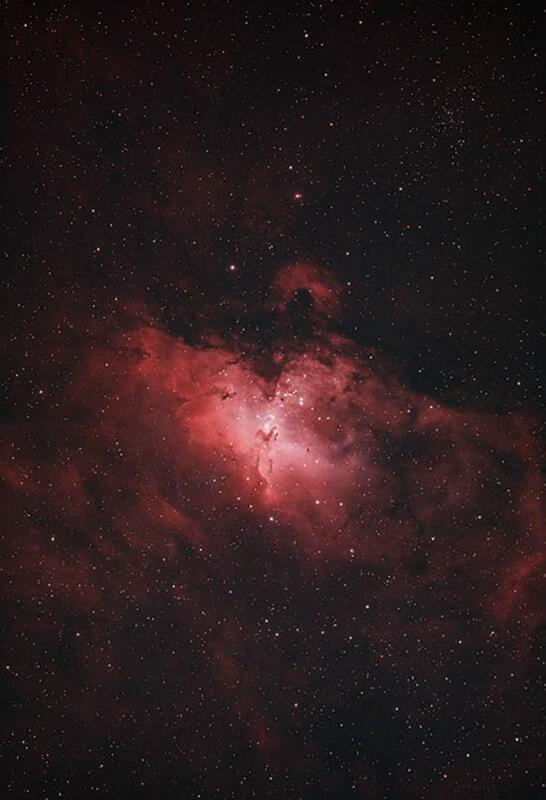 The Eagle Nebula is a bright and colorful red emission nebula in the constellation Serpens. From Mid-Northern latitudes, it reaches high enough into the southern sky to capture using deep-sky astrophotography equipment. As is the case with all deep sky astrophotography targets, the key to a successful image of the Eagle Nebula is to capture an adequate amount of overall exposure time on the object. You’ll land on the Eagle Nebula by punching in NGC 6611 to the keypad of your computerized telescope mount. This designates the embedded star cluster associated with this nebula. The Eagle Nebula contains several active star-forming gas and dust regions, and is one of the brightest in our night sky. 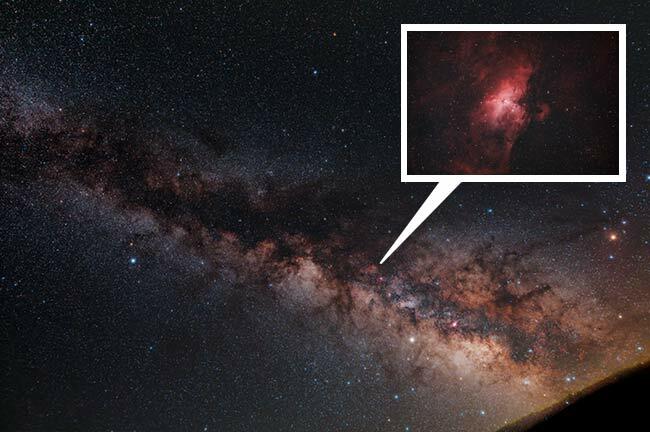 “The Eagle” can easily be identified in long-exposure images of the Milky Way like the one you see below. 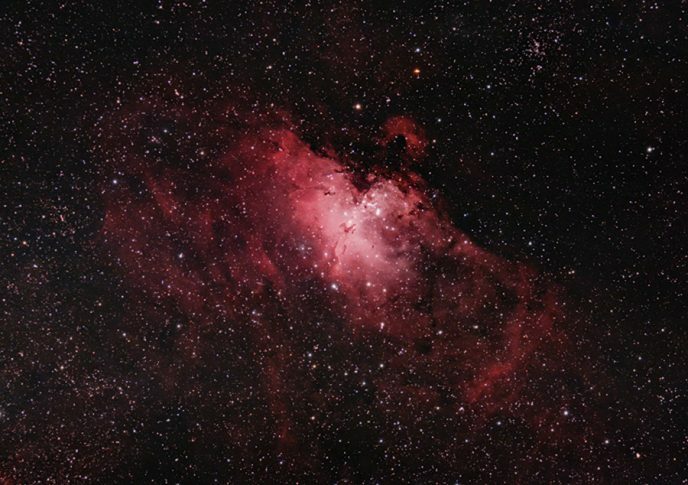 The Omega Nebula sits just below the Eagle Nebula, in a separate constellation (Sagittarius). This is another H II region of the night sky, and is equally as stunning and beautiful as M16. As you can tell, this is a dense and populated area of the night sky, and one that amateur astrophotographers spend a lot of time photographing. The image above was captured using a DSLR camera and wide-angle camera lens on the iOptron SkyTracker Pro camera mount. The exquisite skies at the Cherry Springs Star Party are rated at Bortle 3 on the light pollution map, and some of the darkest skies I have ever experienced. While there, I also photographed the Eagle Nebula using my Explore Scientific ED102 telescope. The Eagle Nebula isn’t the only emission nebula with an embedded star cluster within it, not even close. 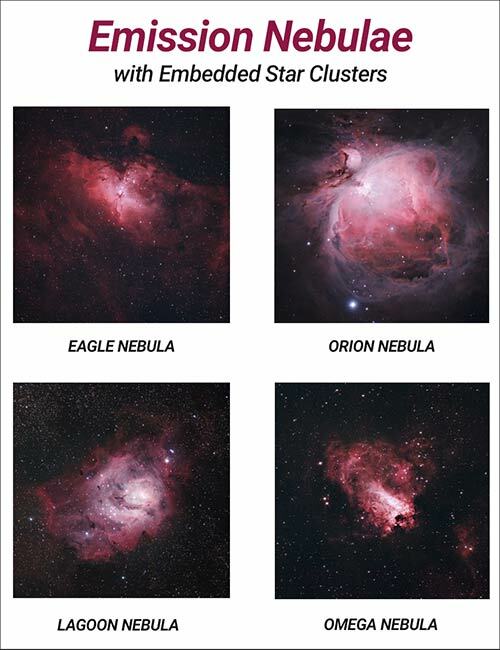 Some other famous H II regions include the Orion Nebula, the Lagoon Nebula, and the Omega Nebula. As far as deep sky astrophotography targets go, the Eagle Nebula is quite bright. With an apparent magnitude of +6.2, even a short 30-second exposure enough to start recording the intense glow of the core. It’s also a fine visual observation, even under moderately light polluted skies. I enjoy cruising around the summer Milky Way nebula including M16 with my 15×70 Celestron SkyMaster binoculars in June and July. From the city, you can expect to need about 1-2 hours’ worth of integrated exposure time before revealing the faint details of the outer nebula regions. This target tends to “grow” as you add more and more exposure time. (A narrowband h-alpha filter will also help). In the following video, you’ll see me set up my telescope and computerized equatorial mount at a dark sky site. I cover some of the basics of deep sky imaging through a telescope and share my final image of the Eagle Nebula at the end. When it comes to astrophotography, there is no substitute for dark skies. 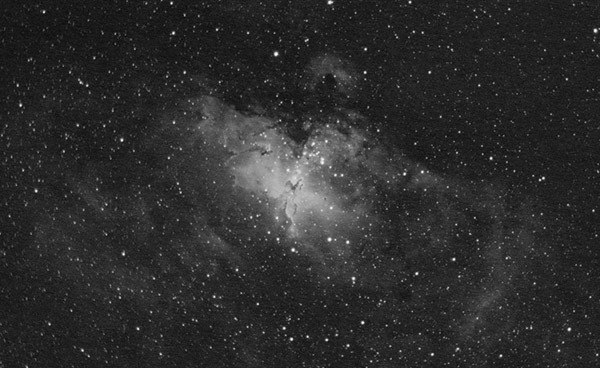 The best image I’ve managed to capture of the Eagle Nebula was in my backyard, using a cooled one-shot color camera. I used a ZWO ASI294MC-Pro to collect 32 x 6-minute exposures through a William Optics FLT 132 refractor telescope, using a duo-narrowband filter. The extra light gathering power a refractor telescope with a large aperture like the FLT 132 provides is beneficial when photographing faint deep sky targets. This is a rather large and heavy telescope, which meant I needed a robust equatorial mount to track the apparent movement of the night sky. For this task, I employed the iOptron CEM60 Center balanced equatorial mount. I’ll admit, most of the signal (light) emitted from M16 is in the Hydrogen Alpha wavelength on the spectral graph, so the OIII data likely did not add much to the detail of the image. With that being said, however, this filter has a way of producing a rather natural looking photo in narrowband – straight out of the camera. The camera used to capture the image above utlizes a cooled CMOS sensor with TEC. Although this is beneficial for capturing long exposure images with very little thermal noise, a stock DSLR camera is more than capable of photographing this nebula. A modified DSLR will help reveal the rich red colors of the hydrogen gas in this nebula, as a stock camera’s IR filter will block this light wavelength. The photo of Messier 16 below was captured using an astro-modified Canon Rebel Xsi (450D) DSLR camera and a 102mm refractor telescope. 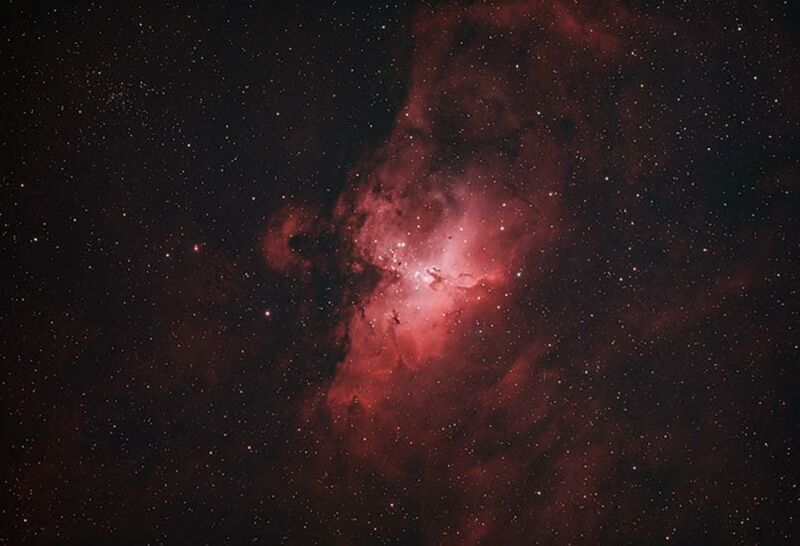 The Eagle Nebula photographed using a DSLR Camera and Refractor Telescope. Capturing the Eagle Nebula in Ha will uncover an impressive amount of bright hydrogen gas in the nebula. A filter such as the 12nm Astronomik Ha filter reduces the size and brightness of the overwhelming surrounding stars and brings the delicate structure of this nebula forward. Creating a HaRGB composite of this object is a great way to highlight the beautiful glowing gas in M16. For more astrophotography images, please visit the photo gallery. Please follow the AstroBackyard YouTube Channel for the most up-to-date information. For a detailed walkthrough of the image processing techniques used in the images above, please visit the astrophotography tutorials section of this website.